O2, Museum of London and Saint@RKCR/Y&R triumphed at the Revolution Awards 2011, which were held last night at The Grosvenor House Hotel on London's Park Lane. O2 marketing director Sally Cowdry walked off with the digital marketer of the year trophy. Cowdry has spent 12 years at the mobile network and has consistently employed digital marketing to boost the brand. Highlights over the last 12 months include O2 Academy TV and O2 Learn, dubbed the UK's biggest classroom. Brothers and Sisters' StreetMuseum iPhone app won the coveted Revolution Award for Innovation. The app, which tempted Londoners to visit the museum, used augmented reality activated through an iPhone app to enable people to discover how the city's streets have changed over the years. 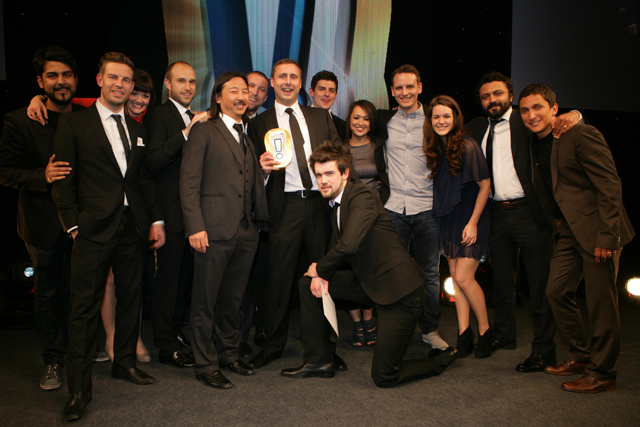 Saint@RKCR/Y&R won the agency of the year gong, after a stellar year that saw turnover jump 24% to £7.2m. Judges praised Saint for its "well executed, well-thought-out-ideas" and the variety of its work. It was a tough category, with AKQA and Zone both coming close to landing the prize. The Grand Prix, which awards the most effective work across all of the categories, went to Doritos and AMV BBDO for Doritos Late Night, which involved a specially-commissioned 360 degree YouTube music video. Sales of Dorito's rocketed as a result of the drive which promoted the brand's 'late night' flavours. Street Museum iPhone app for Museum of London, by Brothers and Sisters. Sally Cowdry, marketing director, O2. Doritos Late Night by AMV BBDO. Action for Children by agenda21. Volvo emissions equality by Mindshare. easyJet business travel by OMD UK. Nintendo flips out with Aardman by Seventy Seven PR and Fishburn Hedges. Unilever 'Share Happy' smile-activated vending machine by Sapient Nitro London. Pension Surgery for Prudential by Sound Creative. The Holiday Autos comedy road trip by Seventy Seven PR. YouTube LIfe In A Day by Google Creative Lab and rehabstudio. iHobo for Depaul UK by Publicis. Can you draw the internet? for Internet Week Europe by Saint@RKCR/Y&R. StreetMuseum iPhone app for Museum of London by Brothers and Sisters. Nickelodeon October half-term campaign by Polymath Digital. The Marmarati for Marmite XO by We Are Social. Encouragement for Special Olympics Great Britain by JWT London. Magners' social SEO by MPG Media Contacts. VisitBritain.com by Sapient Nitro London.